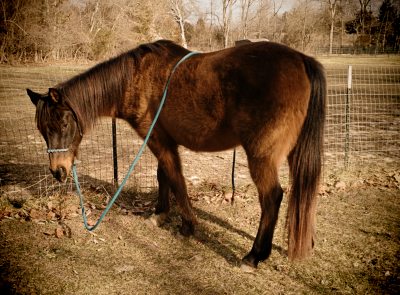 If you've been keeping up with Moon's Meadow, you may remember my writing about adopting a horse named Gemma from Heart of Phoenix Equine Rescue. If you don't recall reading about her or haven't been reading for long you may find out about how I came to adopt her in Opting to Adopt Part One and Opting to Adopt Part Two. Well, finally after almost a month we (BW, her friend, and I) were able to make the 740 mile (which equals to about 1190.91 kilometers) round trip to go get her on Wednesday, April 12. Wednesday, April 12 at 3:00 a.m. I went to bed at 8:30 p.m. Tuesday night in hopes of being able to get a little extra sleep before my alarm went off at 3:00 a.m. I had some luck. I didn't sleep well after waking up at midnight and thus I actually got up at 2:47 a.m. or in other words too freaking early. Some how I didn't stumble around too much but was able to get around and finish gathering a couples things. We were actually out the door about ten minutes before four, which I thought was pretty good given how early it was and how little sleep my husband and I had gotten. He drove me out to BW's (BW is the name I am using for the barn owner where I board) farm since I can not drive at night/when it's dark. We made good enough time that we decided to hit the gas station for fuel and pit stop. We got to BW's by 5:00 a.m. and seeing that the barn was dark I had hopes that she had already done the morning feed. I dropped my cooler and backpack off at the truck and then had my husband drive me across the creek to the house. BW met me at the door and I went inside and met her friend who was letting us use her trailer because it's lighter than BW's and also was going to be a driver. I was dismayed that they still had to both get dressed and the horses hadn't been fed yet. I tried not to be too tense and made sure to keep my phone in my pocket so I wouldn't keep looking at the time. Prayer helped a lot in keeping me calm at this point since God had said that everything would work out fine, I did my best to trust him. We finally left at about this time and were hoping to be to the foster home around noon. Honestly I thought it was after 6:00 a.m. so I wasn't too upset. We did get lucky on our way through St. Louis, which included driving through downtown, that we missed the traffic jams which run rampant during the rush hour. We were able to jet right along and before I knew it we were in Illinois and completely free of the city. I don't remember a lot about this part of the drive. I was tense and tired so I kind of just stared off into space, trying to keep calm. I was tense due to nerves of this actually happening and somewhat feeling like it was surreal. Plus I know I had some nerves about actually having Gemma here. We did make a stop so that they could grab breakfast and so we could all use a bathroom. I-64 gets pretty barren after a certain point so you take your stops when you can. We were in Indiana by about this time, to make such good time I sure wasn't going to ask how fast BW's friend was driving. I'll admit I was quite happy with the time we were making since it would mean we wouldn't get to Kentucky too late and our return to Missouri would be earlier than I had thought. Finally I pulled out my knitting needles at some point and started to finish the dish cloth I had started the day before. A dish cloth is the one and only thing I know how to knit but it's actually quite relaxing. We only had 124 miles to go! Or 199.55 kilometers if you don't use miles. It definitely looked like we would be getting there by about noon. I think this was somewhere in Kentucky. It wasn't much later though that suddenly it felt like we had lost a bunch of time somewhere which was rather confusing. Not a lot of thought was given to it at that point thought since the gps in the truck was taking us a different way than Google Maps wanted, which I had running on my phone. I knew from when my husband and I had come this way on March 17th that once we got off of I-64 things got a little odd. We some how got navigated through all of the different highways and were heading south to the last town before going deeper into the boonies. It was on that southward bound, two lane highway that we put two and two together about the time loss, we had crossed over into the Easter Time Zone and while going down this highway we had come back to the Central Time Zone. Talk about a breath of relief once we realized that because the foster had to leave to go pick her daughter up at 2:30 p.m. and we thought we could run up against that a bit. Luckily we didn't! We got to the farm where Gemma had been living since last October at about 12:15 p.m. We were all quite happy with the time we made. As the foster and I were on our way out to get Gemma from the pasture I apologized about the time scare and explained what had happened. We chuckled a bit about it and chatted in between her calling for the horses. When they finally came through, Gemma decided she didn't truly want to be caught but once the foster got up to her she didn't have any issues with getting the halter on. I then led her to the trailer and tied her to it so I could put on some pillow wraps to help protect her legs in case she bumped against the sides of the trailer too much. In all honesty it was more for my peace of mind than anything since the trailer was a slant load and thus is much easier for a horse to ride in. The truly great thing is that this was probably the first time Gemma had ever had any leg wraps on and she took it all in stride. Taken shortly before loading Gemma. The foster and BW's friend got some hay put in the haybag I brought and tied that up in the trailer. Then I got Gemma loaded which was not issue at all, tied her in and we got it all closed up to be ready for trailer. I should say we shut the divider and the door, the windows were slid open to let air blow through so she wouldn't cook while we traveled. After being wished luck and my saying thank you to the foster, we were out of there before 1:00 p.m. and heading west and north. We did stop at a Subway so they could get some lunch (I brought all of my own food due to my long list of food allergies) and the whole time we were in the restaurant for them to eat, Gemma was perfect in the trailer. BW and her friend weren't too certain about this since in our area rescue horses aren't viewed very well. Needless to say Gemma has started changing opinions already. Once we were back on the road our e.t.a. for getting back to BW's farm was about 7:30 p.m. I knew we'd stop at least once more since with hauling a horse more fuel would be used. However, the stop didn't add much time at all and during that stop Gemma whinnied once but was other wise perfectly quiet in the trailer. I was so proud of her. We never really felt like she was in the trailer at all during the entire trip. She impressed the other two women. At this time we still had 210 miles/337.96 kilometers to go. The Millennium Arch in downtown St. Louis. I think it was a bit before seeing the arch that I emailed my husband to let him know that we had 65 miles to go and we were on track to get back at about 7:30 p.m. After all he had to come pick me up so I could get home. We got back to the farm close to the time we thought we would. My husband was already there but he hadn't been for long. He was actually still eating the sandwich he had bought at a gas station. Once the truck rolled to a stop I got my cooler and back pack out and put them in our Jeep so i wouldn't forget anything. Then I went over to the trailer, opened it, and unloaded Gemma. She got off the trailer very well and then stood and snorted as she looked at her new surroundings. To me the snorting is a typical thing since Cocoa did that quite often when he would disembark. BW's friend held onto Gemma while I took the wraps off her legs and then I took her to her pen. She led fairly well for having been cooped up for so long and in an utterly new place with new people. Gemma went right for her hay after I took the halter off. I made sure I had all of my stuff, thanked BW and her friend, said goodbye to Gemma, and then my husband and we started for home at about 8:00 p.m. That was the longest drive home ever. I was running on not much sleep and had been in a truck almost all day so I was utterly exhausted. Once we were home I got some food, a shower, and crashed for the night. It was about 10:20 p.m. by that point. I was hoping to sleep until at least seven but I ended up too awake by about 6:30 a.m. so I got up. One of my first thoughts when I woke up was, "I can't believe she's actually here!" Even today it still feels a little surreal. My husband decided to take the day off and drive me out to Gemma since I felt like my head wanted to be it's own drum section. We took our time getting around to leave since we were both exhausted from the previous day. Upon our arrival the manure guy was there to scoop up the manure pile and take it away. Gemma didn't care for the tractor and was being a bit nervous but she didn't freak out. She pawed some but for the most part she just stood back and watched. She also kept saying hello to her neighbor, Ruby. The two seem to like each other quite a bit. My husband and I stood in Ruby's pen while all this went on near where Gemma was standing. Gemma breathed in my face once and I think she would've done it a second time but her nose ran into the bill of my baseball cap which surprised her. Once the manure guy was I gone I did some sharing territory with Gemma until a couple of other boarders arrived. We talked and they petted my new girl and then I decided to be done with sitting in the chair for the time being. I knew with being tired I wouldn't be able to get the present focused mind back after the disruption. So I left Gemma alone for a bit before coming back with a halter which I had no issues getting on. Gemma in the round pen. After that I took her into the round pend and did that for a few minutes since it's something she knows. She actually seemed to like doing it and was more content looking afterwards and I got her to focus on me too. She was even more content after she got to graze while I groomed her. She really seemed to enjoy the rubber curry comb since it got deeper and removed more of the hair she's shedding. Gemma really loved having around her ears scratched with a brush as well. In fact when I put her back in her pen she lowered her head and bobbed it at me to ask for her ears to be scratched again. I happily obliged. I am extremely proud of her. She is in a new place with new people and while she is a bit nervous, she's taking most of it in stride. I am very much looking forward to growing our bond and trust. She is an awesome little mare and she'll just get better the more time we're together. I still miss Cocoa and I always will but I am not going to let that over shadow the joy of having my little rescue girl. She truly is a dream turned reality. It was but at least it was fun!